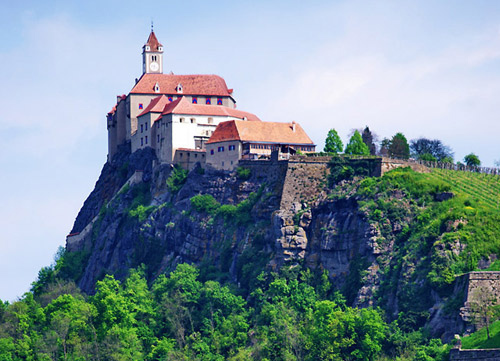 One of the many day trip options in Austria is going to see it’s castles, we were staying in Styria and decided to visit the more well known castle Riegersburg. The fortress is built on volcanic rock and parts date back to the 1200s. It’s about a 20 minute hike up to the castle and as you get higher the view gets more beautiful, on clear days you can see as far as Hungary. The scenery alone is worth a visit! Once you’ve trekked up through the many entrance ways and moats you are rewarded with a beer garden (thankfully almost every tourist destination in Austria will reward you with beer and wine) where you can enjoy a cold Gosser or wine spritzer! Riegersburg has a great witch “Hexen” exhibit where you can learn about the witch hunts of the 1600’s and check out some awesomely designed exhibits. The most interesting witch who’s story is on display is the Rose witch, who was burned and decapitated bc she was able to grow roses year round and during a particularly harsh winter. After the witch exhibit you enter Riegersburg proper where there are some predictable but still breathtakingly opulent living quarters and banquet halls. My favorite display was a Knights feast of nobles stuffing themselves with food and wine, only to vomit after on the “vomiting bridge”. If after this display of gluttony you start to feel hungry you can take a 15 minute drive to have lunch at castle Kapfenstein. Kapfenstein is an old castle again with beautiful views, an amazing restaurant and vineyards that surround it. The family that runs the restaurant also owns the vineyard so the wines are not only affordable but really delicious. We had great weather so got to sit on the terrace and enjoy a lovely rose and lunch of new-austrian fare with a focus on seasonal and organic (yep everyone’s doing it). 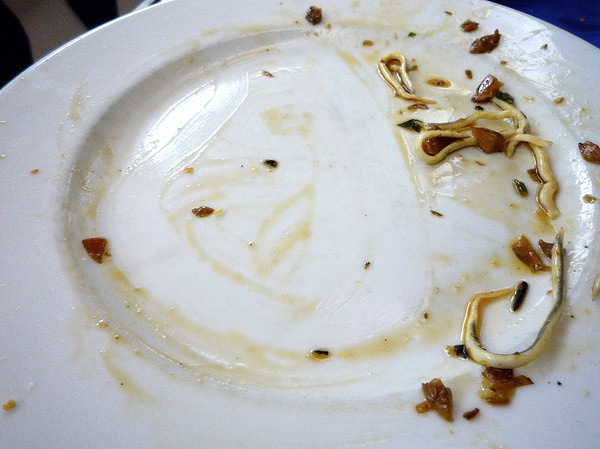 The chef is also a believer in making vegetarian dishes as relevant on the menu as the hearty meat fare (Marcus had Ox)! “Mondays are tricky to eat out in Spain. A lot of the good restaurants are closed so it makes your options limited. However, it’s El Cisne Azul‘s best day. The reason? So the owners can head out to the countryside the day before to harvest the freshest mushrooms in the area. 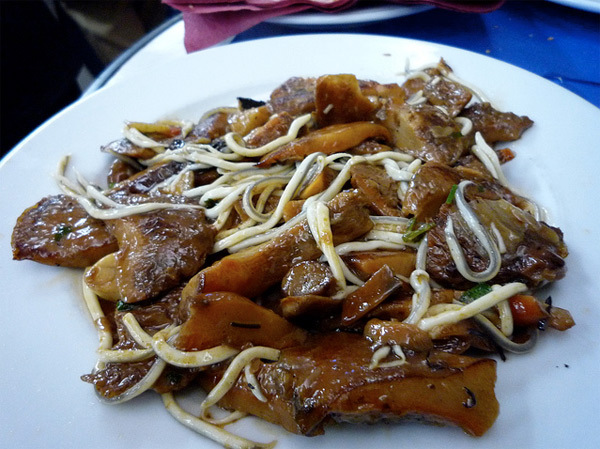 Mushrooms are the specialty here and they have about ten different kinds that they serve about ten different ways. We were a little overwhelmed when we saw the menu, but looked around at some dishes coming out and pretty much pointed and said ‘that’s what we want’. It turned out to be a great strategy. We had mushrooms with cheese, mushrooms with foie gras, and mushrooms with a sort of ‘pasta’ that we later found out was imitation baby eel. It was all delicious. They have other spanish specialties like fish, ham, and local beef but the next time we’re there we’ll definitely be pointing at new mushroom dishes to try. “We spent a little while looking for this place since it came up a lot in our Madrid research. It was well worth it. La Venencia is definitely a taste of old-world Madrid. They only server sherry on draft from large wood casks. The decor is authentically rustic with dusty old bottles and a chalkboard to tally up your orders. 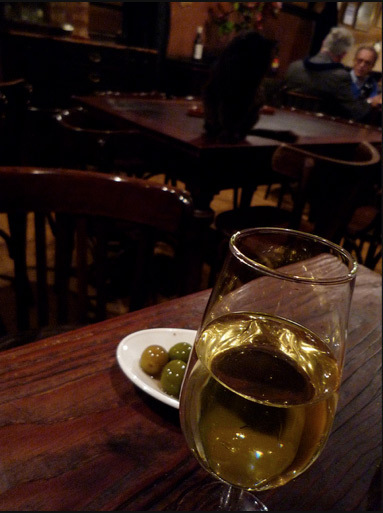 It’s a great place to explore sherry while you eat olives near their fireplace and get closely monitored by the resident black cat.